I doubt if i'd buy movies from iTunes or anywhere else. I'm a dvd fan but the option should be there eventually and I welcome it. I could have sworn that I saw something about movies when i was just scanning over the new version after I updated. I remember saying that it seemed funny that movies were to play on iTunes. Then I thought they might sell music videos. I can't seem to find the references now. Oh yeah. If you click on edit ->"show search bar" there is a button for videos. I also found a cool new feature, at least to me, under "edit" - "show duplicate songs". I had a bunch of those, somehow. Lord have mercy this feature is going to save my bacon. I have two library that need to be merged but that'll mean hundreds of dupe songs. I hope I can highlight a bunch of duplicates and trash them all at once to unify my collection. Sniffle....it's sooo beautiful. Show duplicate songs has always been there, though it may have been hidden somewhere else. They need a way of spoofing a track, or aliasing one. For example I have R.E.M. 's Sweetness Follows in Automatic For The People and the Vanilla Sky soundtrack. What I'd like to do, say, is have it under Automatic For The People and have an alias to it under Vanilla Sky. Thus if I'm listening to Vanilla Sky, it comes to Sweetness Follows and plays it from Automatic For The People, adding 1 onto the play count of that real Sweetness Follows track. YES YES MOTHER OF GOD YES! Yeah, I've thought of that once or twice. YES. i know exactly what you mean. The best examples i can think of where this is REALLY neeed is with the Ministry of Sound CDs. They put some great tunes on them, but frequently they'll have one or two songs on about FOUR different mixed CDs. Deleting them means that the CD won't play smoothly like a mixed CD should. I could see the price going down due to technology...that's a given eventually, but right away because they are not yey FLYING off the shelves?? GEEZ.......people have not even seen one yet! Give them a chance! I'd consider it a slap in the wallet if this happened. It would tick off the loyal Apple faithful who buy without seeing first. I'd be VERY irked!! Interesting. So vodcasts are on iTunes now, too. You still can't "watch" them on iPods...yet. The video version of Diggnation has been up on iTunes since the start. And we also had icons for the video then, just a different icon. Wouldn't it say 'buy movie' if it where for something other than music vids/podcasts? It's for music videos, no doubt. 1) iMovie video can be saved as music videos. 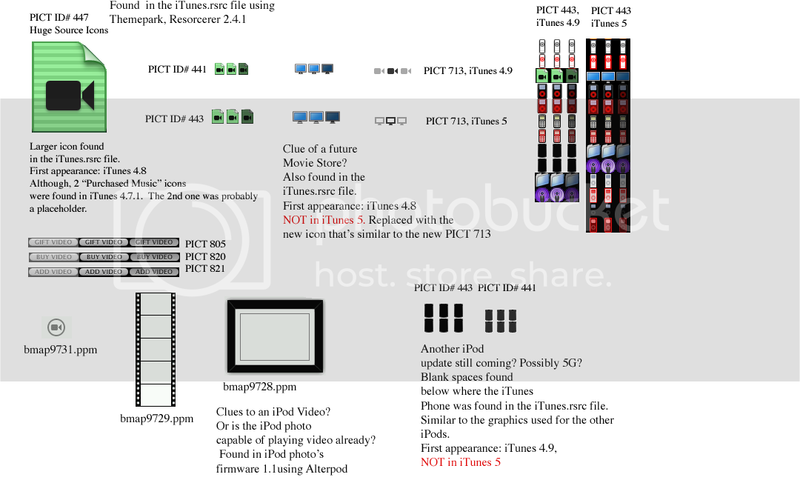 Record child's song at school play, display information like videos do at the beginning/end, enter ID3 tag information and add to iTunes library. 2) iDVD will have a way to easily organize the videos with minimal input from the user. Where movies have 'scene selection', 'deleted scenes', 'extras', etc., iDVD will use the ID3 tag information, 'Artist', 'Song', 'Producer', etc., as group information. 3) iTunes will be able to burn videos to disk, but you will have to navigate like you do a regular music CD, one track at a time or randomly. "Find Duplicate Songs" has been around for a while, but when used with the browser and search bar, finding duplicate songs is quicker. In the search bar select 'Music' on the left side and 'Song' on the right side and show duplicate songs. After all the songs are shown select the artist and then an album and you will see what songs are duplicates. Type the name of a duplicate song in the search box and all the albums that song is on will then be displayed. From there it is just a matter of deciding whether or not to delete the song. The link for the new Systm.org iPodcast. It shows the new cinema display icon. I think would it would be cool if, one could make a song in garageband, make a home music video for it in iMovie, and publish them both together on itunes similar to what iMix is now. and even maybe if some other user sees this homemade song/music video and likes it enough to want to purchase it, they could buy it and the money go back to the maker of the song in like an itunes account so they could use that money for future purchases. Kind of farfetched but I'm putting the idea out there. i posted a picture from my nano firmware of that very video icon here on appleinsider. my question is how did you get the images to look right? 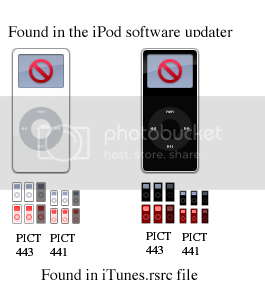 I think they are screwed up because they were stored in BGR and the computer was viewing them as RGB... Did you convert them or has an update been issued for some ipod firmware hack utilities?